The Integrate Area module provides a way to quickly sum pixel areas defined as rectangles in order to determine the amount/strength of a rectangle area within the current image. This process allows you to find rectangle areas within the image that show a higher collection of pixels despite being disconnected or small in size. The module is useful in determining the presence of a specific type of object after being processed by simple filters that highlight specific pixel properties. For example, it is possible to detect the presence of specific textures that are detected using convolution filters. Note that because the integration area is a rectangle, only pixel groupings that form rectangular groups are appropriate for this module. 1. Integration Size Width/Height - The width and height of the area to integrate or sum. This defines the area of window that will be moved across the current image. 2. Show Integration - Select to view how the image appears after the integration process has scanned the entire image. a. Automatic - Normalizes the results based on the highest integration detected. b. Low - Uses 1/8 of the total scan window size as the expected maximum integration value. This helps highlight lower integrated windows. b. Medium - Uses 1/4 of the total scan window size as the expected maximum integration value. c. High - Uses 1/2 of the total scan window size as the expected maximum integration value. 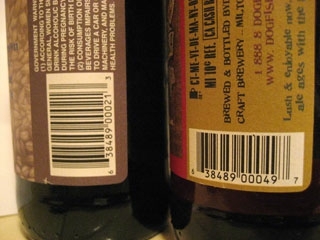 Click Here to download the example that identifies the vertical barcodes and click here to download the horizontal version. Note, the array contains 11 numbers per peak entry.